When it comes to compact track lifts, Teupen is the name material handling businesses around the world trust and rely on. For over 35 years, Teupen lifts have been redefining the way you work while providing the support necessary to raise your bottom line. Whether your industry is construction and facility maintenance or window cleaning and venue management, our Teupen lifts for sale can help you tackle the highest jobs and maneuver through the tightest spaces. Having the right lift equipment provides a sustainable advantage in meeting challenges and maximizing resources and productivity. 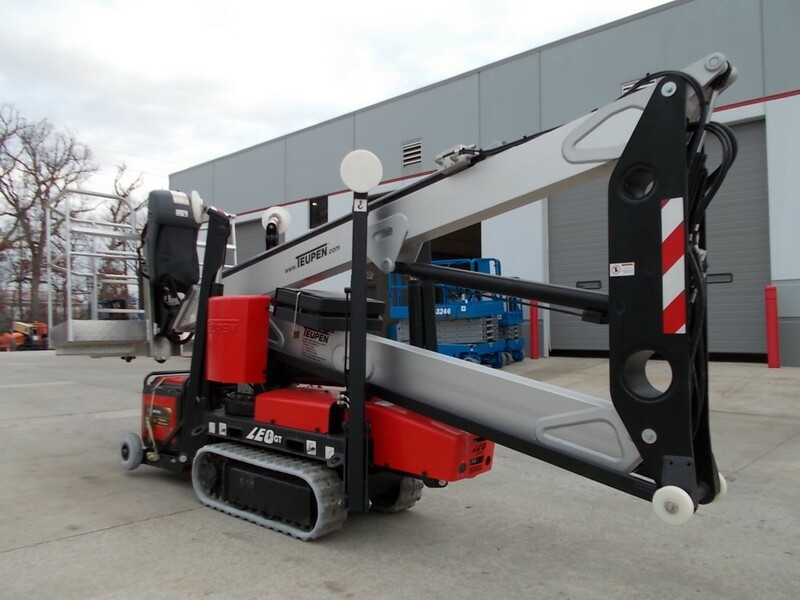 Teupen aerial lifts feature innovations in safety, user comfort and ease of operation. Key cutting-edge features of its line of lifts include compact design, simple setup, exceptional versatility and flexibility. From computer-monitored safety and stability systems to low ground pressure that protects sensitive surfaces, a Teupen lift makes getting the job done easier. The LEO Series of Teupen lifts comes in both single-door and double-door accessibility and ranges in outreach from 19 feet, 10 inches to 49 feet, 10 inches. The Canopy Series is specially configured for the tree care industry and features lift trucks capable of working at heights in excess of 98 feet. Whether you’re a growing business on a temporarily restrictive budget or simply don’t have a need for the latest lift truck technology, we carry the pre-owned solutions you’re searching for. Chicago Industrial keeps an impressive stock of used Teupen lifts for sale in our massive showroom in Rockdale, IL. In our on-site reconditioning shop, we carefully restore all of the used material handling equipment we sell to peak operating performance. When you buy used Teupen lifts from us, you can be sure you’re getting a great value and competitive price. Browse our inventory today for current availability. Don’t see what you need? Give us a call at 815-744-8811 for assistance finding exactly what you’re searching for. Thanks to our association with Direct Credit, we’re able to help you find a flexible financing rate to make your lift truck purchase more affordable. The process is simple using our online application system, and it only takes a few minutes to complete. Chicago Industrial not only offers Teupen lifts for sale across North America, but we also can ship to locations around the world. Just let us know which piece of equipment you are interested in from our inventory, and we’ll be happy to provide a no-obligation quote. The lift equipment you invest in plays a major role in your ability to compete. Chicago Industrial offers comprehensive material handling solutions that help your business reduce downtime and increase productivity. Give us a call or contact us online today for additional information on our selection of top-quality Teupen lifts for sale today.